Click here for more market data. Stocks ended mixed Wednesday as investors tried to make sense of better-than expected economic reports and gauge the mindset of the Federal Reserve. The Dow Jones Industrial Average and the S&P 500 closed modestly lower, while the Nasdaq managed to notch out slight a gain. 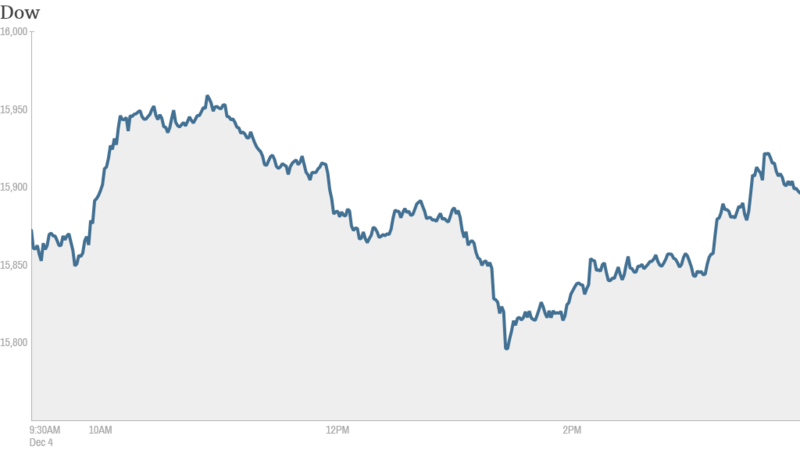 The Dow and S&P 500 have fallen for the past four days. Investors were paying close attention to economic data. In its Beige Book report on regional economic activity, the Fed said the economy expanded at a "modest to moderate pace" from early October to mid-November. It noted gains in the auto and high-tech industries and reported that retailers are "hopeful, but cautious" about the holiday shopping season. Investors remain fixated on clues as to when the Fed might pull back, or taper, its $85 billion per month bond buying program. The three indexes were in the green earlier Wednesday after the Census Bureau said sales of new single family residential homes rose 25% in October compared to September, topping economists' expectations. That report came after payroll processor ADP (ADP) reported that 215,000 private-sector jobs were added in November -- well above the 160,000 gain that was expected. Bond investors stayed focused on when the Fed might taper. The yield on the 10-year Treasury note was 2.83% after spiking to 2.85% earlier in the day, near the year's high of almost 3% back in September. At that time, investors feared the Fed would taper at its meeting in September. It didn't. But some experts believe that the Fed could now announce it is pulling back on stimulus at the conclusion of its next meeting on December 18. 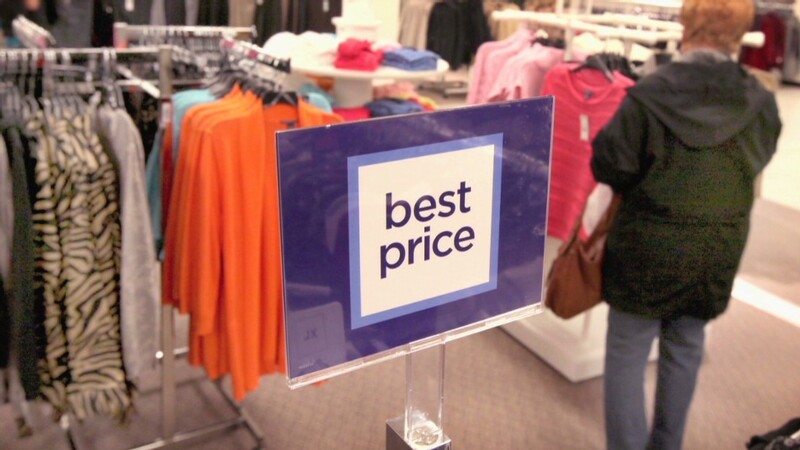 In corporate news, J.C. Penney (JCP) said Tuesday that same-store sales in November grew 10% from the same period last year. The stock, which has been the worst performer on the S&P 500 this year, is in the midst of a turnaround and has caught the attention of some major hedge funds. But investors seemed unimpressed with the decent November sales. Shares of J.C. Penney ended the day down over 4%. Despite that, one trader on StockTwits was bullish that it would bounce back by the end of the day. $JCP green by close," said Jason100. That didn't happen. Others were optimistic, but acknowledged it's a difficult trade. "$JCP only patient ppl or idiots can win this stock LOL", said Smellyegg. Shares of Deere (DE) jumped over 3% after the agricultural machinery giant announced it boosted its share repurchase program. "Stopped out of $DE ystdy after holding for 2 weeks & today they announce buyback" said Sspencer_smb, a StockTwits trader who worried he missed out on the stock's recent move. Another mover was Hewlett-Packard (HPQ), which closed more than 2% higher after reports that the PC and printer maker plans to shed 1,100 jobs in its U.K. unit. StockTwits trader Shaggyeleven was not buying the stock for now, but is keeping a close eye on it. "$HPQ not in, watching, if keeps moving like this, thinking, I'm missing something." Also trending on StockTwits: Apple (AAPL). Shares of the iPad maker have surged back to life in recent months, gaining almost 50% from its 52-week low earlier this year. Activist investor Carl Icahn reiterated in an interview with Time Wednesday that he wants the company to buy back more of its stock. "$AAPL slow and steady rise the rest of the day" said trader ChazMac09. Facebook (FB)shares jumped 4%, giving it an overall gain of over 82% since January. There was a lot of chatter that the social networking stock could soon be added to the S&P 500.